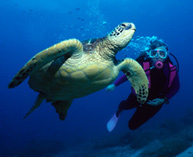 Grand Turk offers scuba diving in a pristine environment, located on the world's third largest coral reef. The healthy corals, diverse marine life and exceptional visibility have made our island into a scuba diving destination - voted in the top 10 in the World - and top 2 in the Caribbean. There are more than 25 excellent dive spots, starting at about 30 feet underwater, and then the ocean wall plunges down into the abyss. The wall is a 10 minute boat ride from the hotel beach, where your dive shop will conveniently pick you up. Osprey Beach Hotel can book your dive with any of the three dive shops on the island. Go for a leisurely horseback ride along the beach while enjoying the view of the crystal clear waters of the Atlantic Ocean. Next, the guides will unsaddle the horses and outfit them with water blankets. Remount your horse and go for a swim in the ocean together! Enjoy excellent snorkeling in the clear ocean waters, just steps away from your hotel room. Look for colorful parrot fish, trumpet fish, octopus and more. Explore one of Grand Turk's nicest beaches, located in front of the Governor's residence. White sand and crystal clear water makes this a wonderful snorkeling spot. Catch a boat to an uninhabited island. Snorkel and free dive along the way, and enjoy a picnic lunch at Gibbs Cay. Visit with friendly stingrays in the shallow water right off the beach. 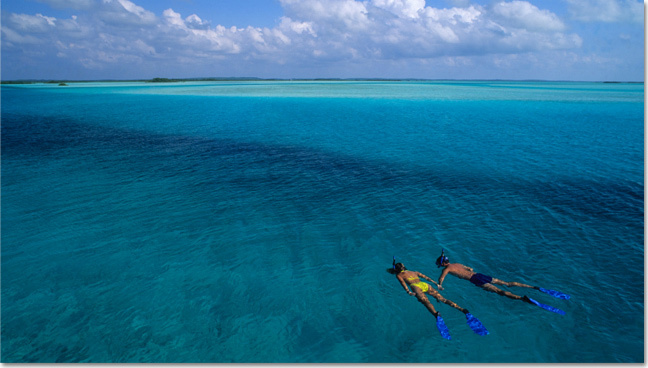 Take a day trip to Salt Cay to scuba dive and snorkel. Or explore the Endymion wreck, a 140 ft. wooden hulled British warship, which sank in 1790 after hitting the reef. Snuba is a simple, fun introduction to the underwater world of scuba diving. The Snuba air hose system is connected to an inflatable raft with an air tank which floats after you on the surface. No prior experience is required, just a quick 15 minute lesson. Explore the tranquil waters of North Creek in a clear bottomed kayak. Your guide will introduce you to the native plant and animals that you see along the way, and explain the ecological importance of the mangroves. See the Humpback whales up close! These North Atlantic whales migrate past Grand Turk in late January, February, March and early April. Grand Turk offers excellent fishing for tuna, snapper, wahoo, and blue marlin. Learn to fish with a hand line like a local fisherman, or fish with salt water tackle. Fly fishermen will enjoy the challenge of catching bonefish in North Creek. The Grand Turk Lighthouse is over 150 years old and offers an view of the treacherous Northeast reef, responsible for an untold number of shipwrecks. Nearby you will find the lighthouse keeper's residence. Climb behind the wheel of a dune buggy! Head off down the narrow tracks that may be found on Hawk's Nest Plantation at the south-eastern side of the island. Take a trek to the bluff at Gun Hill for a beautiful view of Gibb's Cay and the few uninhabited islands visible in the Atlantic Ocean. See the island on your own unguided tour. Head over to the North for some breathtaking views of the entire island, visit the North Creek, and stop by the Crabtree Corner Community Park. Learn about the cultural history of the islands, including the early discovery of Grand Turk, the impact of early European settlement, natural and political history, and the role played in the 20th century space exploration. Also featured is the Wreck of Molasses Reef, an archeological excavation of a 1513 shipwreck. See Grand Turk by bicycle! Ride down picturesque Duke Street and glide into town by the shore to explore Cockburn Town. See the many different styles of island homes, some more than a century old. The island is six miles long and one mile wide, with mostly flat terrain with a few rolling hills. Cockburn Town is the administrative capital of Turks & Caicos. Both Duke and Front streets have 18-19th century buildings with Bermudan-style architecture. Walk past the Parliamentary building, courthouse, salt ponds, old churches, and a public library. Cannons mark the arrival of Christopher Columbus in 1492. Pack your binoculars! Turks & Caicos offers over 190 bird species to observe throughout the year, with 52 species breeding locally. Some of the birds you may see on Grand Turk include ospreys, pink flamingos, reddish egrets, yellow-crowned night herons, indigo bunting, bananaquit, and Bahama Woodstar hummingbirds. Locally-owned shops offer Grand Turk shell ware and beach glass jewelry in addition to shops offering high end, duty-free diamonds and watches. This tourist village is packed with shops and Jimmy Buffet's Margaritaville. The area features one of the largest pools in the Caribbean, wave machine, and an 800 foot stretch of beach. There is nothing like a Grand Turk sunset! Sip a cool drink by the hotel pool and watch for the green flash, an optical phenomenon that often occurs just as the sun disappears below the ocean horizon. Locals will tell you it's not so elusive at all.